Inso's World: Time for some heavy hitters. Time for some heavy hitters. Hello again. Welcome to Inso's World and this week I have managed to achieve another tick in the army box. 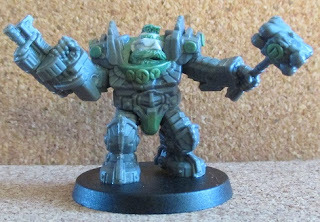 A while ago, I decided that I couldn't have a Squat army without exo armour so I thought that the Forge Guard that I got as part of my Mantic 'Deadzone' Kickstarter parcel, would be perfect for the task. I had to think how these would fit in with the army and it was an obvious choice to count them as space marine terminators so I decided to equip them in line with a standard terminator squad. His armour is a little more ornate than standard exo armour and I've added a few extra runes... and obviously replaced his head. He has a standard storm-bolter and power-weapon combination. I now have a HQ unit and an elite unit for the space marine part of the army. Once the two small scout squads are added, that will be a further two troops units and it will make it a legal ally the my Astra Militarum part of the army (which is the main part). The reason I have been working on these this week, is that I am really tired and I didn't feel that I would be able to sculpt well enough to do the army command squad justice. Life has been far too 'interesting' lately and, hopefully, this little milestone will be the start of more to come. In other news, last update I mentioned that my Dad was in hospital. Well, he has since had an operation on his neck and is in much better shape. He will be in hospital for a couple of weeks yet but now he has had the surgery, he can concentrate on getting rehabilitated. My Dad is in his seventies so his treatment has been a big worry to me and my family which has impacted on sleep, work and family life. Hopefully, now the big worry is out of the way, things can start getting back to normal but these things take time. See you from the garden of great relief!